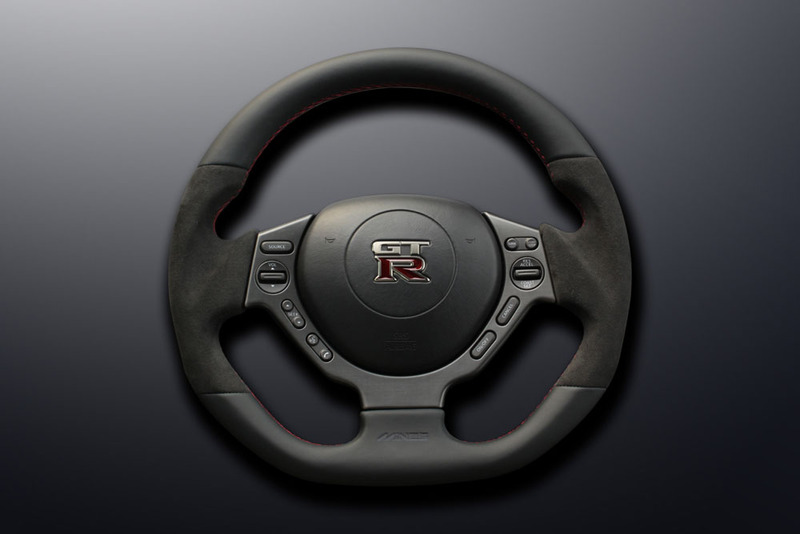 This original leather steering wheel for R35 GTR has a combination of the highest grade leather and Alcantara finishes. The Nappa Leather, which is frequently used for the European luxury automobiles, is used for the top and bottom of the grip. 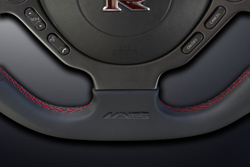 The Nappa leather utilizes the chromium compounds in its tanning process. Its smooth and soft texture is really exceptional and its beauty is eye-catching. 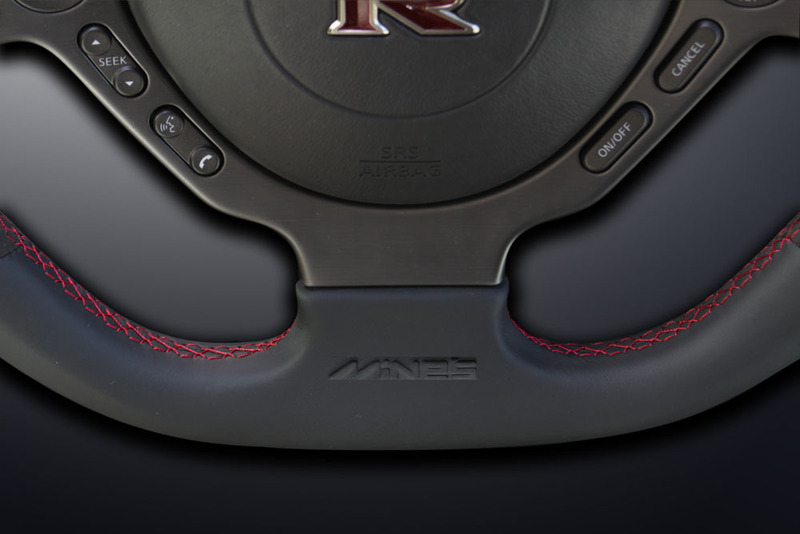 For the grips, Alcantara is chosen as the production material due to its super comfortable touch and nonslip quality for the excellent gripping feel. 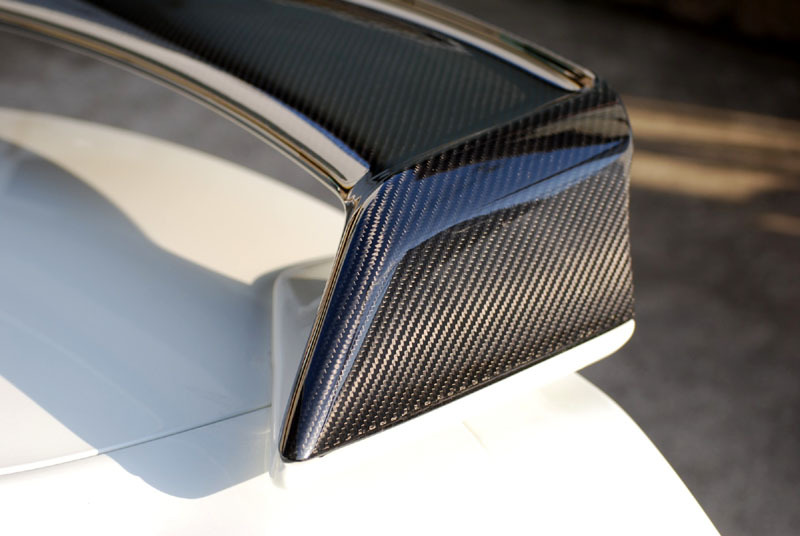 Both functionality and appearance are very well thought of. 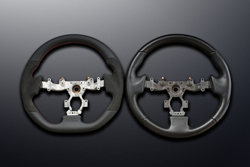 The distinctive features are 1) 5mm smaller size compared with the stock, 2) increased thickness in all over the grip, 3) unique 'D' shape. 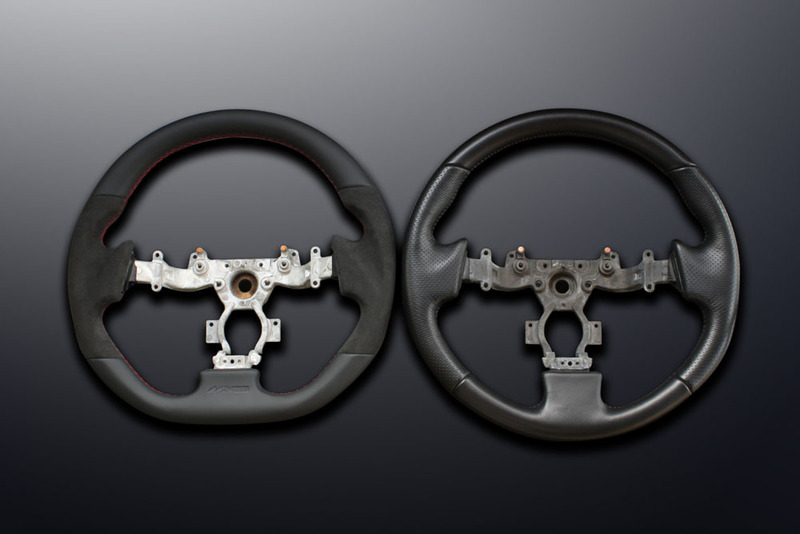 From the material to design, this steering wheel boasts the superb sophistication in every respect, which you can only get from Mine's. 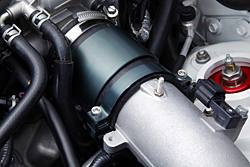 This special clamp is made of aluminum and designed for preventing the stock hose from falling out due to an expansion of the stock inlet pipe especially when the boost is increased. 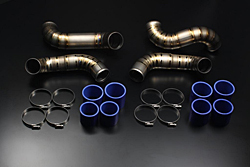 Unlike the stock hose band, Mines induction support & clamp checks the expansion of the stock pipe and results in not only preventing the stock hose dislocation but also improving the throttle response. 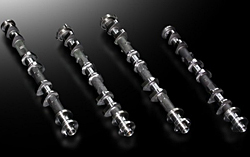 The surface of the product is anodized for an excellent durability. 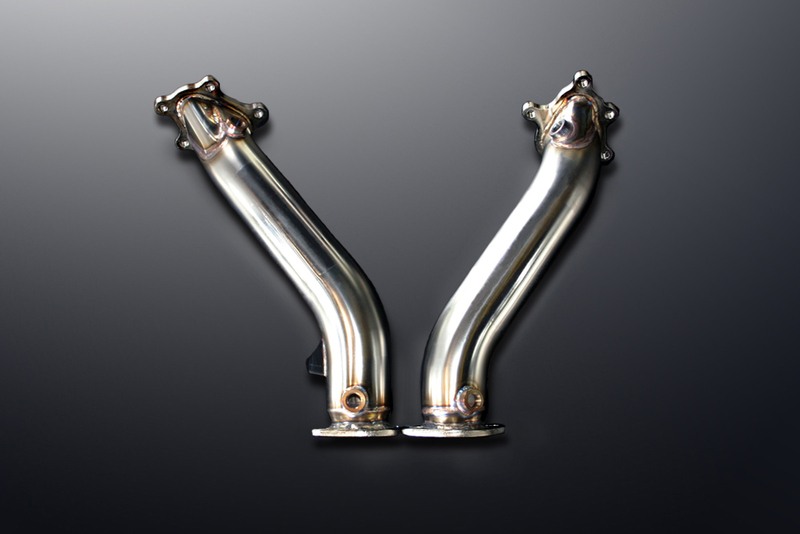 Made of titanium, the Mines Suction Pipe reduces the internal air resistance to the minimum. 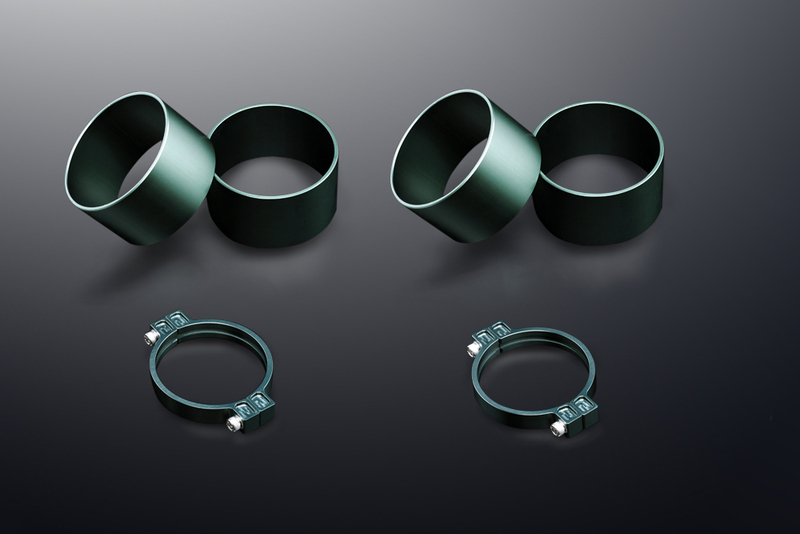 Instead of using bending method, Mines uses a process of connecting sliced round titanium, which eliminates the internal wrinkles and roughness and keeps the internal shape as close as a prefect circle. 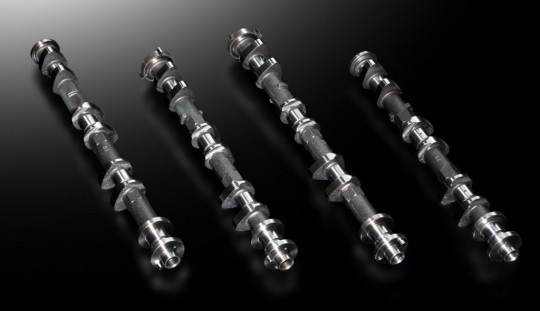 The diameter is also increased to 60mm from the stock 45mm. As the result, this product brings a real throttle response improvement you can feel. 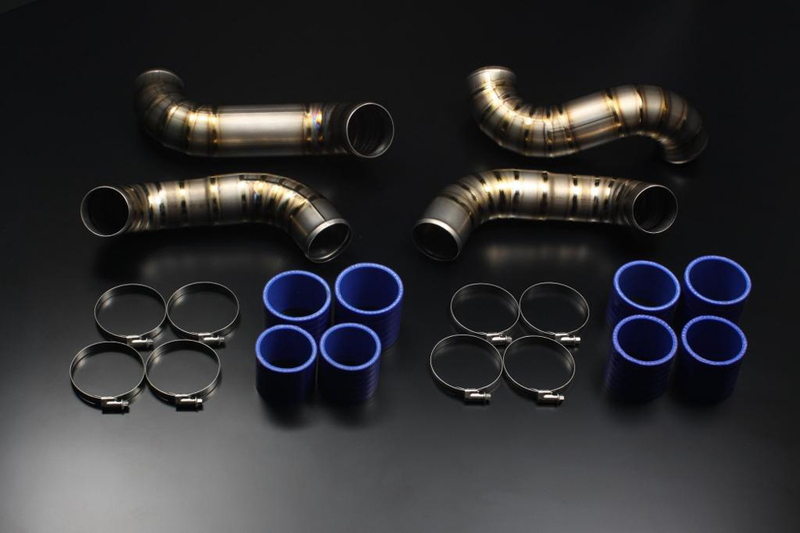 It comes with SAMCO silicone hose. 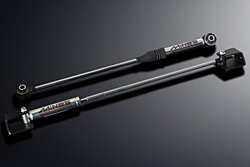 The Mines High Flow Throttle System firstly widens the diameter by 2.5 mm to increase the absolute quantity of air flow and secondly achieves the ultimate air flow efficiency by eliminating the unevenness of the internal surface and by modifying the butterfly shaft and bolts. 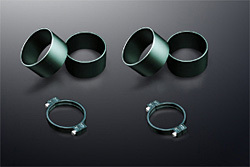 The internal surface is machined with a ultra precision diamond tool and then is mirror finished to transform the surface to an ideal "ventur tube" shape. 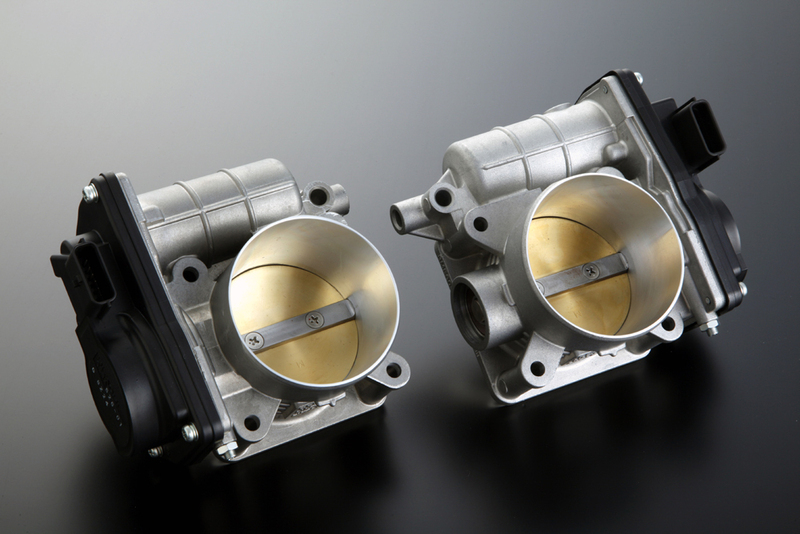 The product promises the ultimate throttle response experience. 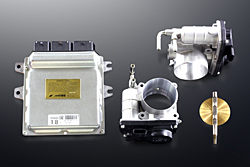 Mines highly recommends a modification of ECU in order to enjoy the maximum potential of the Highflow Throttle Body. 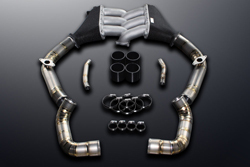 $1,554.00 (with core exchange) - the price includes the return shipping to you but you have to send your throttle body to Mines. The Super Outlet Pro II eliminate the first stage catalytic converter which is a main obstacle on the exhaust system. 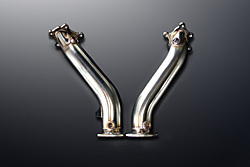 Made of stainless, the product improves the exhaust flow and increases the power in all ranges of the rpm. 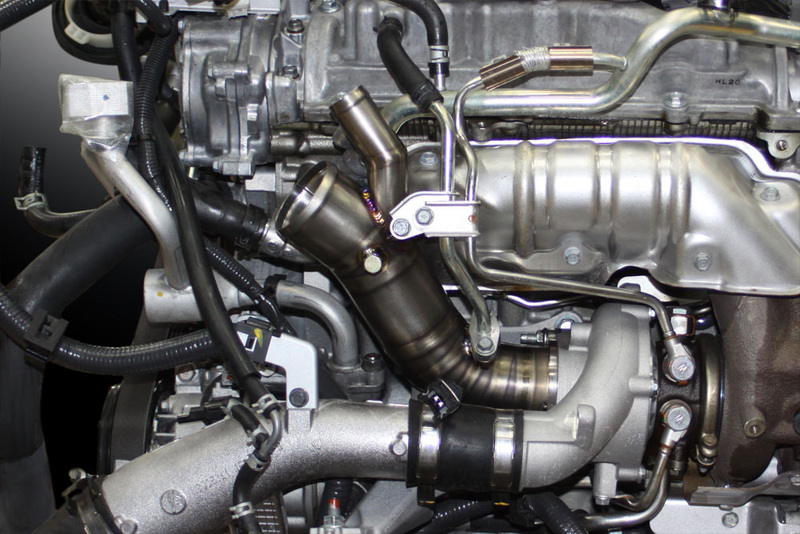 Please note Nissan special tool KV101 13700 is required to remove and put on the stock O2 sensor. 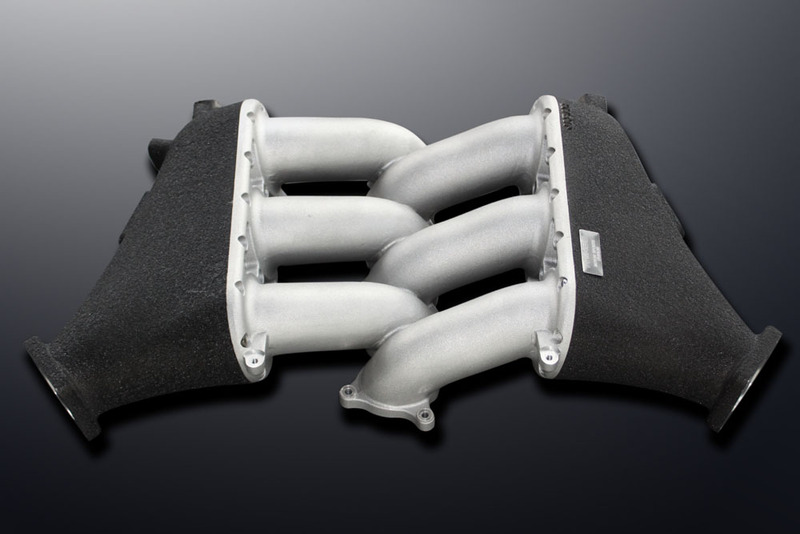 The stock intercooler pipe is not ideal when you raise the boost level. It could expand and could cause a dislocation. Mines titanium pipes prevent any negative impact from a higher boost and provide the excellent throttle response. 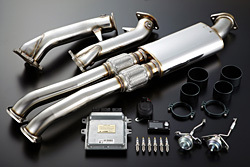 The pipes are made of titanium with the excellent finish in every detail. This Spec-X 6.0 kit is designed for a customer who seeks for a higher horsepower and better throttle response. 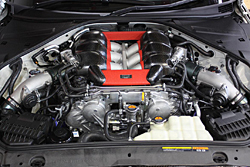 The VX-ROM (Type X) is tuned for a higher boost and the parts are selected to maintain the boost level at the high RPM range. 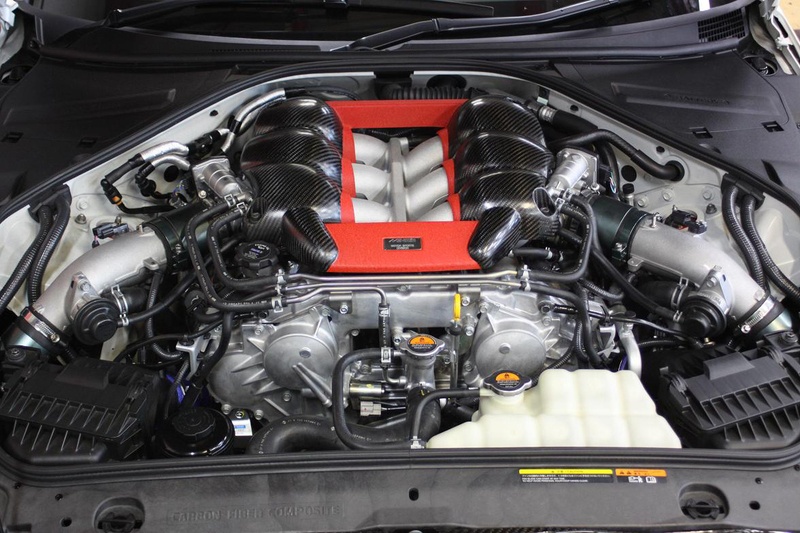 The kit will generate about 600 horse power when it is used with 100 octane gas and Mines titanium exhaust. 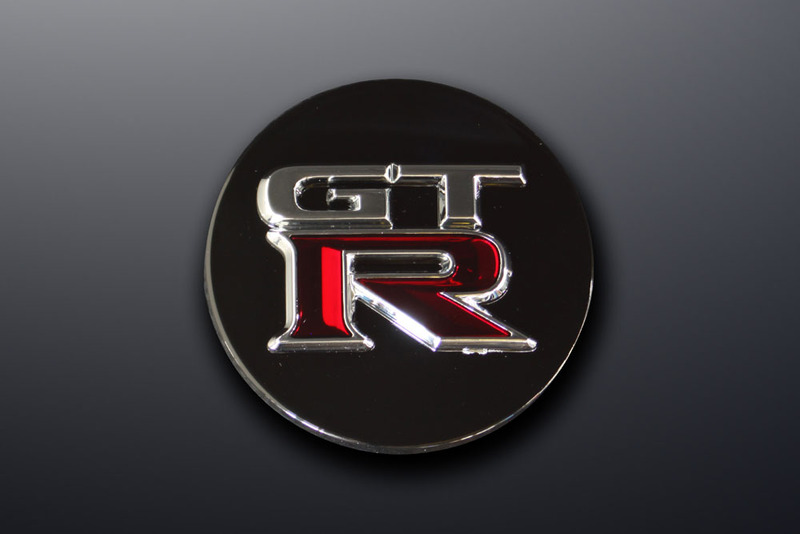 For U.S customers who intend to use 94 octane gas, the max horse power will be limited to around 550. The customer is asked to ship the ECU to Mines for reprogramming. 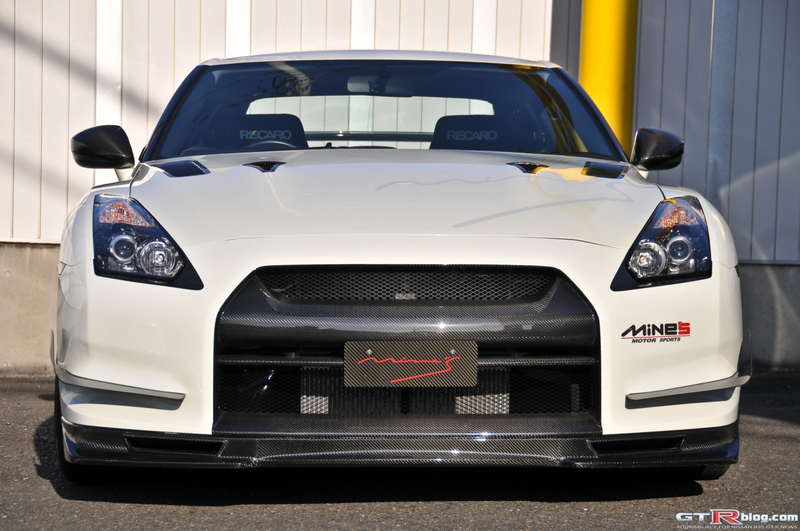 The Mines dry carbon front bumper made its public debut last month (January 2010) at Mines week long event at their shop in Japan. Note: Selecting the proper shims might take a time when installing the product. 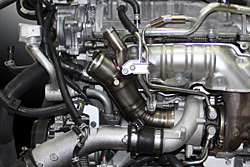 The piston & connecting rod are replaced along with the camshaft. 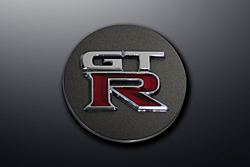 With its amazing throttle response, you feel your GT-R is 400 pound lighter. 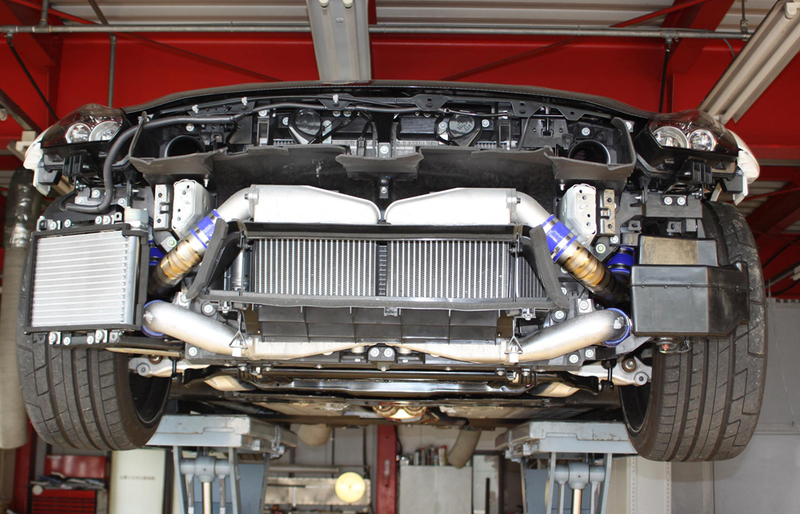 While your car is on the road, it does not matter if it is on the street or on a race track, the vehicle's body is susceptible to the constant vibration and the force to twist due to the change in road surface condition, cornering force, and the energy from acceleration / deceleration. 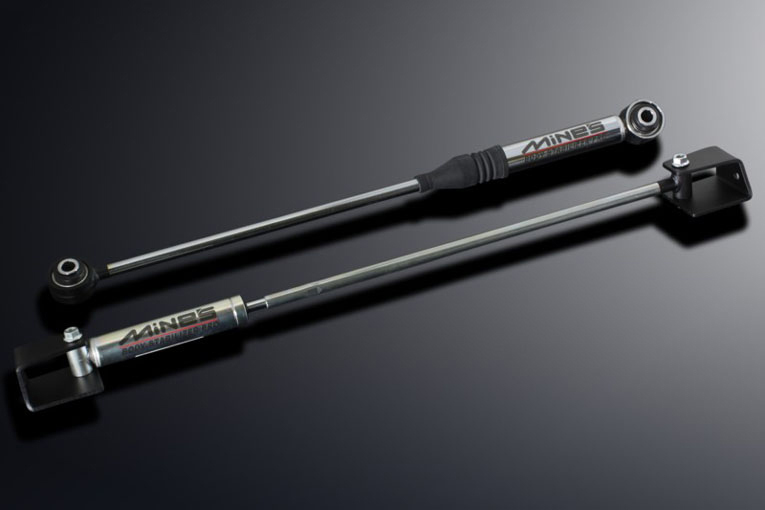 Mines Body Stabilizer Pro alleviate those unwanted vibration and forces in any driving condition, consequently improving the quality and performance of your driving. The secret of the effectiveness is to find out the best combination of damper strength and the place to install the device. From the countless driving tests, the Mines Body Stabilizer Pro promises the best stabilizer to your GTR. 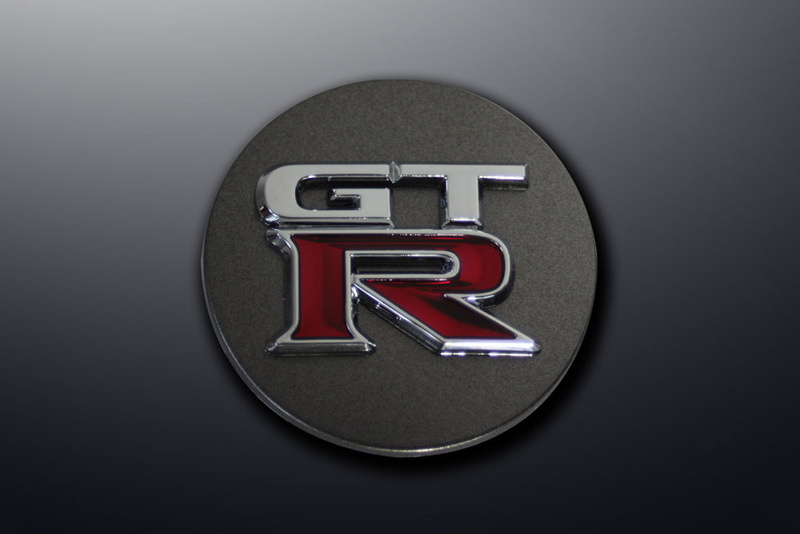 A Mine's original wheel cap dedicated to the stock GT-R wheel. 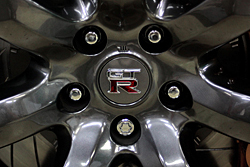 It is a replacement of stock "Nissan" wheel cap. The red letter "R" in the center of the cap really stands out. 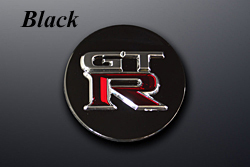 The background color is available either in stock Dark Chrome or black. The air inflow control is one of the important aspects in tuning the high powered engine. 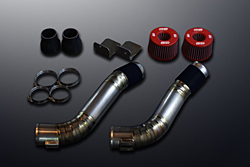 Every component from the air filter, piping, and the sensor sensitivity has to be reexamined to achieve the maximum gain. 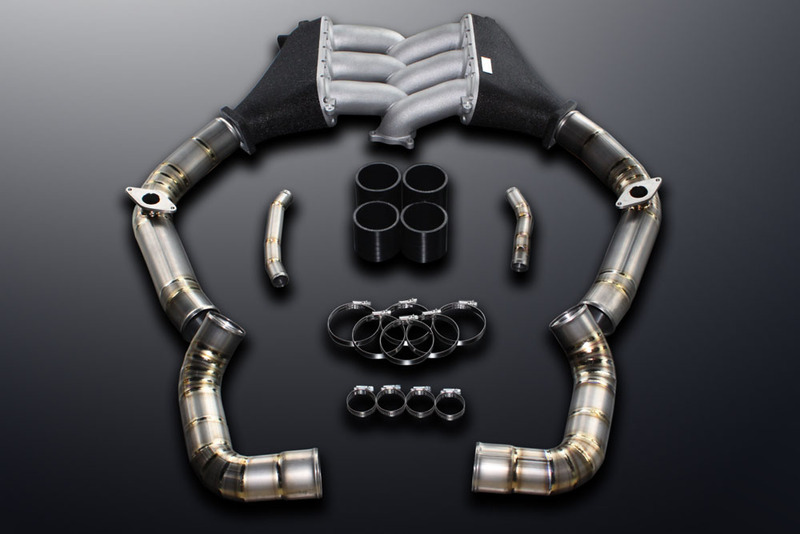 This system utilizes the special air filter manufactured by the BMC which is very well known for its contribution to F1, Le Man, and many other professional race series. This air filter increases the contact area by 40 % compared with the stock and along with the air induction panel achieves the superb efficiency. 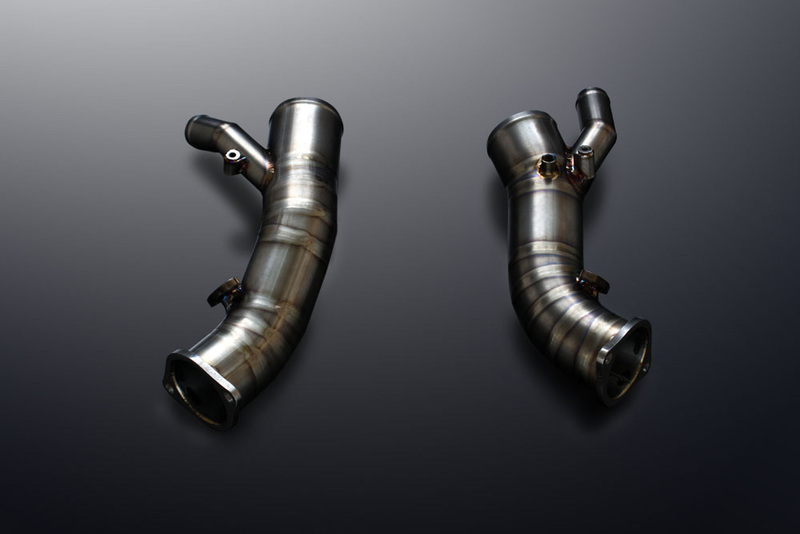 Made of titanium for the ultimate weight reduction, the 80 pai(80 �E pipe [the stock pipe is 70 ø] brings out the maximum potential from the performance turbine and injectors. 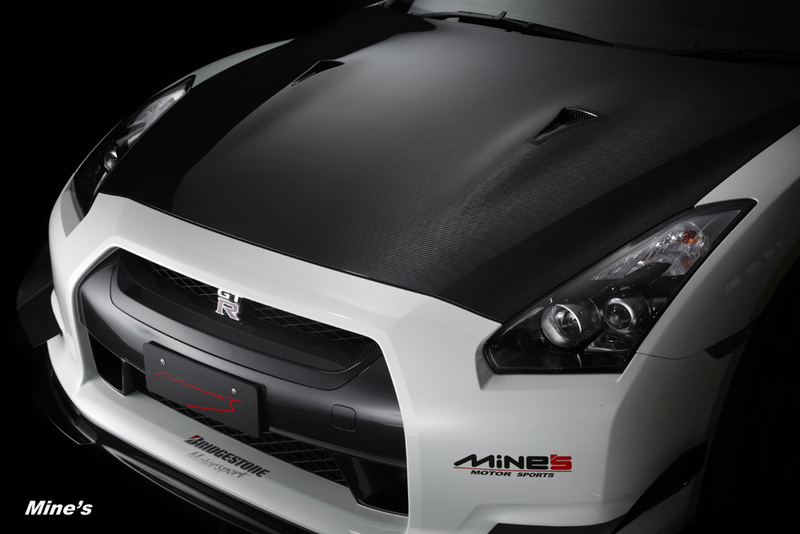 Mine’s has released its original surge tank and titanium piping kit for R35 GTR. The picture on the left shows what are included in the kit. The picture on the right is the surge tank installed on Mine’s complete engine 4.1. 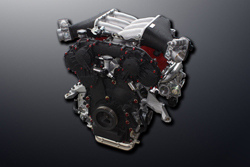 It provides an impressive power gain for a modified engine, especially with a larger turbine. It can be used with the stock engine. 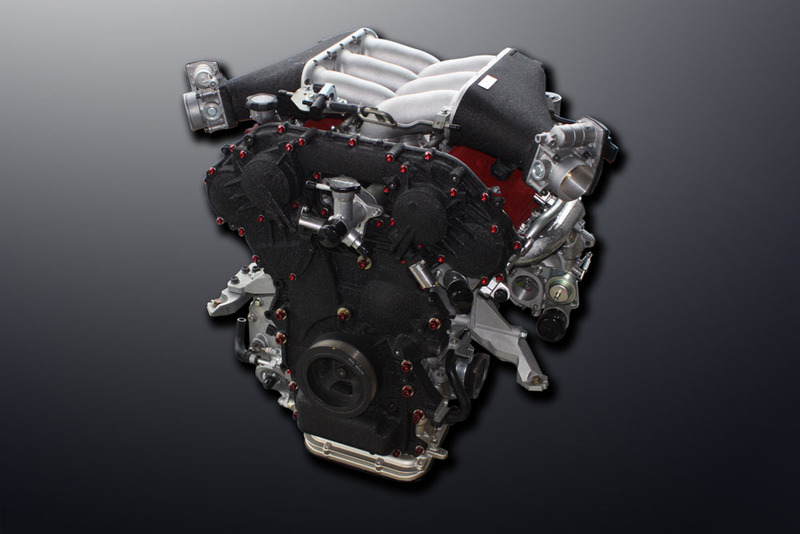 However, the horse power gain is limited to 20 to 25 hp with the stock engine. 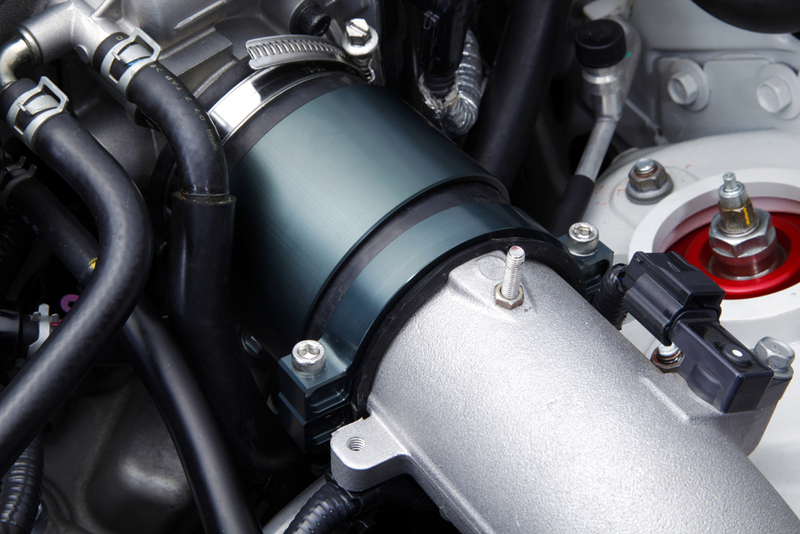 This surge tank works extremely well with the Mine’s 4.1 liter Complete Engine especially showing a rise in power and torque above the 4,000 RPMs range. Compared to the stock surge tank, a base of 5 % increase of power can be found.